“Red Chillies” redirects here. For the film, see Red Chillies (film). “Hot pepper” redirects here. For other uses, see Hot pepper (disambiguation). Christopher Columbus was one of the first Europeans to encounter them (in the Caribbean), and called them “peppers” because they, like black pepper of the genus Piper known in Europe, have a spicy, hot taste unlike other foodstuffs. 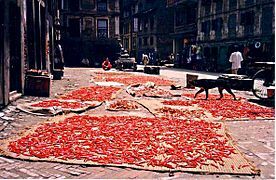 Diego Álvarez Chanca, a physician on Columbus’ second voyage to the West Indies in 1493, brought the first chili peppers to Spain and first wrote about their medicinal effects in 1494. Upon their introduction into Europe, chilies were grown as botanical curiosities in the gardens of Spanish and Portuguese monasteries. Christian monks experimented with the culinary potential of chili and discovered that their pungency offered a substitute for black peppercorns. Worldwide in 2016, 34.5 million tonnes of green chili peppers and 3.9 million tonnes of dried chili peppers were produced. 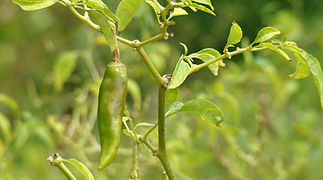 China was the world’s largest producer of green chilis, providing half of the global total. 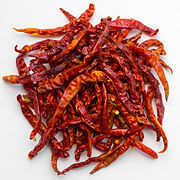 Global production of dried chili peppers was about one ninth of fresh production, led by India with 36% of the world total. When peppers are consumed by mammals such as humans, capsaicin binds with pain receptors in the mouth and throat, potentially evoking pain via spinal relays to the brainstem and thalamus where heat and discomfort are perceived. The intensity of the “heat” of chili peppers is commonly reported in Scoville heat units (SHU). Historically, it was a measure of the dilution of an amount of chili extract added to sugar syrup before its heat becomes undetectable to a panel of tasters; the more it has to be diluted to be undetectable, the more powerful the variety, and therefore the higher the rating. 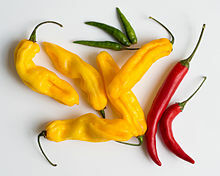 The modern method is a quantitative analysis of SHU using high-performance liquid chromatography (HPLC) to directly measure the capsaicinoid content of a chili pepper variety. Pure capsaicin is a hydrophobic, colorless, odorless, and crystalline-to-waxy solid at room temperature, and measures 16,000,000 SHU. 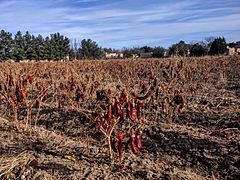 Capsaicin is produced by the plant as a defense against mammalian predators and microbes, in particular a fusarium fungus carried by hemipteran insects that attack certain species of chili peppers, according to one study. 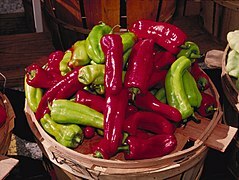 Peppers increased the quantity of capsaicin in proportion to the damage caused by fungal predation on the plant’s seeds. ‘Nduja, a more typical example of Italian spicy specialty, from the region of Calabria, is a soft pork sausage made “hot” by the addition of the locally grown variety of jalapeño chili. Psychologist Paul Rozin suggests that eating chilies is an example of a “constrained risk” like riding a roller coaster, in which extreme sensations like pain and fear can be enjoyed because individuals know that these sensations are not actually harmful. This method lets people experience extreme feelings without any risk of bodily harm. Conflicts between farmers and elephants have long been widespread in African and Asian countries, where elephants nightly destroy crops, raid grain houses, and sometimes kill people. Farmers have found the use of chilies effective in crop defense against elephants. Elephants do not like capsaicin, the chemical in chilies that makes them hot. Because the elephants have a large and sensitive olfactory and nasal system, the smell of the chili causes them discomfort and deters them from feeding on the crops. By planting a few rows of the pungent fruit around valuable crops, farmers create a buffer zone through which the elephants are reluctant to pass. Chili dung bombs are also used for this purpose. They are bricks made of mixing dung and chili, and are burned, creating a noxious smoke that keeps hungry elephants out of farmers’ fields. This can lessen dangerous physical confrontation between people and elephants. Birds do not have the same sensitivity to capsaicin, because it targets a specific pain receptor in mammals. Chili peppers are eaten by birds living in the chili peppers’ natural range, possibly contributing to seed dispersal and evolution of the protective capsaicin in chili peppers. Chili is widely used in historically Anglophone regions of the United States and Canada. 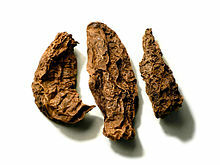 However, it is also commonly used as a short name for chili con carne (literally “chili with meat”). Most versions are seasoned with chili powder, which can refer to pure dried, ground chili peppers, or to a mixture containing other spices. The name of the plant is almost certainly unrelated to that of Chile, the country, which has an uncertain etymology perhaps relating to local place names. Chile, Colombia, Ecuador, Panama, Peru, Dominican Republic and Puerto Rico are some of the Spanish-speaking countries where chilies are known as ají, a word of Taíno origin. Though pepper originally referred to the genus Piper, not Capsicum, the latter usage is included in English dictionaries, including the Oxford English Dictionary (sense 2b of pepper) and Merriam-Webster. The word pepper is also commonly used in the botanical and culinary fields in the names of different types of chili plants and their fruits. ^ Dasgupta, Reshmi R (8 May 2011). “Indian chilli displacing jalapenos in global cuisine – The Economic Times”. The Times Of India. ^ “HORT410. Peppers – Notes”. Purdue University Department of Horticulture and Landscape Architecture. Retrieved 20 October 2009. Common name: pepper. Latin name: Capsicum annuum L. … Harvested organ: fruit. Fruit varies substantially in shape, pericarp thickness, color and pungency. ^ Kraft, KH; Brown, CH; Nabhan, GP; Luedeling, E; Luna Ruiz, Jde J; Coppens; d’Eeckenbrugge, G; Hijmans, RJ; Gepts, P (4 December 2013). “Multiple lines of evidence for the origin of domesticated chili pepper, Capsicum annuum, in Mexico”. Proceedings of the National Academy of Sciences. 111 (17): 6165–6170. doi:10.1073/pnas.1308933111. PMC 4035960. PMID 24753581. Retrieved 4 November 2016. ^ a b c d “Chili production in 2016; Crops/World Regions/Production Quantity/Green Chillies and Peppers from pick lists”. UN Food and Agriculture Organization, Statistics Division (FAOSTAT). 2017. Retrieved 3 December 2018. ^ a b Bosland, P.W. (1998). “Capsicums: Innovative uses of an ancient crop”. In J. Janick (ed.). Progress in New Crops. Arlington, VA: ASHS Press. pp. 479–487. Retrieved 23 December 2010. ^ Kraft, K. H.; Brown, C. H.; Nabhan, G. P.; Luedeling, E.; Luna Ruiz, J. D.; Coppens d’Eeckenbrugge, G.; Hijmans, R. J.; Gepts, P. (2014). “Multiple lines of evidence for the origin of domesticated chili pepper, Capsicum annuum, in Mexico”. Proceedings of the National Academy of Sciences of the United States of America. 111 (17): 6165–6170. Bibcode:2014PNAS..111.6165K. doi:10.1073/pnas.1308933111. PMC 4035960. PMID 24753581. ^ “Birthplace of the domesticated chili pepper identified in Mexico”. EurekaAlert, American Association for the Advancement of Science. 21 April 2014. ^ a b van Zonneveld M, Ramirez M, Williams D, Petz M, Meckelmann S, Avila T, Bejarano C, Rios L, Jäger M, Libreros D, Amaya K, Scheldeman X (2015). “Screening genetic resources of Capsicum peppers in their primary center of diversity in Bolivia and Peru”. PLoS ONE. 10 (9): e0134663. Bibcode:2015PLoSO..1034663V. doi:10.1371/journal.pone.0134663. PMC 4581705. PMID 26402618. ^ “pepper”. Retrieved 7 April 2017 – via The Free Dictionary. ^ Ruiz-Lau, Nancy; Medina-Lara, Fátima; Minero-García, Yereni; Zamudio-Moreno, Enid; Guzmán-Antonio, Adolfo; Echevarría-Machado, Ileana; Martínez-Estévez, Manuel (1 March 2011). “Water Deficit Affects the Accumulation of Capsaicinoids in Fruits of Capsicum chinense Jacq”. HortScience. 46 (3): 487–492. ISSN 0018-5345. ^ O’Neill, J; Brock, C; Olesen, A. E.; Andresen, T; Nilsson, M; Dickenson, A. H. (2012). “Unravelling the Mystery of Capsaicin: A Tool to Understand and Treat Pain”. Pharmacological Reviews. 64 (4): 939–971. doi:10.1124/pr.112.006163. PMC 3462993. PMID 23023032. 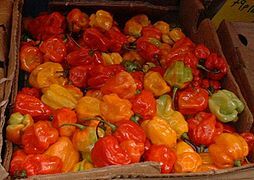 ^ “History of the Scoville Scale | FAQS”. Tabasco.Com. Archived from the original on 23 August 2010. Retrieved 23 December 2010. ^ a b Tewksbury, J. J; Reagan, K. M; Machnicki, N. J; Carlo, T. A; Haak, D. C; Peñaloza, A. L; Levey, D. J (2008). “Evolutionary ecology of pungency in wild chilies”. Proceedings of the National Academy of Sciences. 105 (33): 11808–11811. Bibcode:2008PNAS..10511808T. doi:10.1073/pnas.0802691105. PMC 2575311. PMID 18695236. 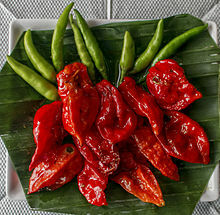 ^ “Chile Pepper Heat Scoville Scale”. Homecooking.about.com. Retrieved 14 April 2013. ^ “The Hottest Chilli in the World was Created in Wales Accidentally”. ^ “Confirmed: Smokin Ed’s Carolina Reaper sets new record for hottest chilli”. Guinness World Records. 19 November 2013. Retrieved 8 November 2014. ^ Joshi, Monika (11 March 2012). 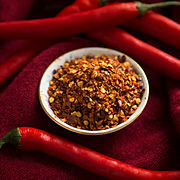 “Chile Pepper Institute studies what’s hot”. Your life. USA Today. Archived from the original on 12 March 2012. ^ “Title of world’s hottest chili pepper stolen – again”. The Independent. London. 25 February 2011. Retrieved 27 February 2011. ^ Henderson, Neil (19 February 2011). ““Record-breaking” chilli is hot news”. BBC News. Retrieved 20 February 2011. ^ Paul Rozin1 and Deborah Schiller, Paul; Schiller, Deborah (1980). “The nature and acquisition of a preference for chili pepper by humans”. Motivation and Emotion. 4 (1): 77–101. doi:10.1007/BF00995932. ^ Fattori, V; Hohmann, M. S.; Rossaneis, A. C.; Pinho-Ribeiro, F. A.; Verri, W. A. (2016). “Capsaicin: Current Understanding of Its Mechanisms and Therapy of Pain and Other Pre-Clinical and Clinical Uses”. Molecules. 21 (7): 844. doi:10.3390/molecules21070844. PMC 6273101. PMID 27367653. ^ a b Haar, R. J; Iacopino, V; Ranadive, N; Weiser, S. D; Dandu, M (2017). “Health impacts of chemical irritants used for crowd control: A systematic review of the injuries and deaths caused by tear gas and pepper spray”. BMC Public Health. 17 (1): 831. doi:10.1186/s12889-017-4814-6. PMC 5649076. PMID 29052530. ^ Mott, Maryann. “Elephant Crop Raids Foiled by Chili Peppers, Africa Project Finds”. National Geographic. Retrieved 23 October 2013. ^ Tewksbury, J. J.; Nabhan, G. P. (2001). “Directed deterrence by capsaicin in chilies”. Nature. 412 (6845): 403–404. doi:10.1038/35086653. PMID 11473305. ^ Rodríguez-Burruezo, A; González-Mas Mdel, C; Nuez, F (2010). “Carotenoid composition and vitamin a value in ají (Capsicum baccatum L.) and rocoto (C. Pubescens R. & P.), 2 pepper species from the Andean region”. Journal of Food Science. 75 (8): S446–53. doi:10.1111/j.1750-3841.2010.01795.x. PMID 21535519. ^ “Definition for chilli – Oxford Dictionaries Online (World English)”. Oxforddictionaries.com. Retrieved 21 April 2012. ^ “Fall in exports crushes chilli prices in Guntur”. Thehindubusinessline.com. Retrieved 21 April 2012. ^ “Chilli, Capsicum and Pepper are spicy plants grown for the pod. Green chilli is a culinary requirement in any Sri Lankan household”. Sundaytimes.lk. Retrieved 21 April 2012. ^ “Chili or Pepper?”. Chilipedia.org. Archived from the original on 20 January 2013. Retrieved 16 January 2013. ^ “va=pepper – Definition from the Merriam-Webster Online Dictionary”. M-w.com. 13 August 2010. Retrieved 23 December 2010.